At its annual outdoor meeting in Diversity Plaza last night, Queens Community Board 3 voted to support two traffic safety projects: a new neighborhood Slow Zone in Jackson Heights and nine additional pedestrian refuge islands on Northern Boulevard, one of the borough’s most dangerous arterial streets. “It was not very contentious at all. 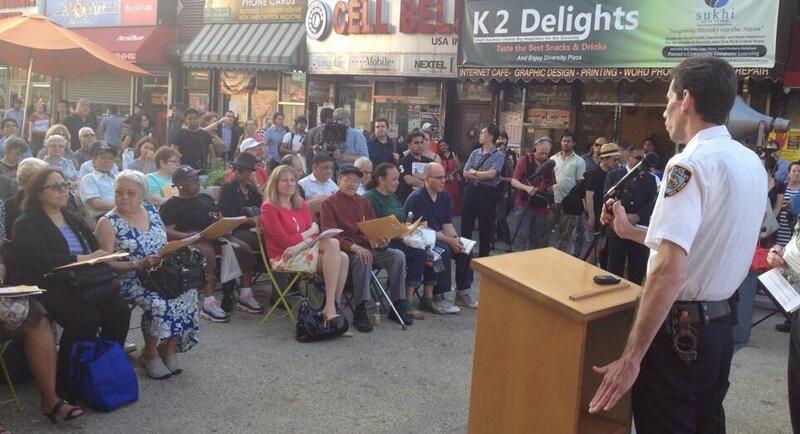 It was definitely a big majority,” said Christina Furlong of Make Queens Safer. “Nobody was especially against it.” CB 3 says the Slow Zone passed 25-1, with two abstentions, and the Northern Boulevard improvements won over the board for a 25-2 vote, with one abstention. The board also asked DOT to extend the Northern Boulevard project [PDF], which will add turn restrictions and pedestrian islands to select intersections along 40 blocks between 63rd and 103rd Streets, east to 114th Street. The Slow Zone will add 20 mph speed limits and traffic calming, including 26 new speed humps, to an area covering nearly one-third of a square mile, bounded by 34th Avenue to the north, 87th Street to the east, Roosevelt Avenue to the south and Broadway and the Brooklyn Queens Expressway to the west. This area, encompassing six schools, two daycare and pre-K facilities, and one senior center, was the site of 28 severe injuries to pedestrians and vehicle occupants from 2008 to 2012, and three traffic fatalities from 2007 to 2014, according to DOT [PDF]. There are already two neighborhood Slow Zones in CB 3, in Corona and Jackson Heights/East Elmhurst. Slow Zones have seen a 10-15 percent reduction in speeds, a 14 percent reduction in crashes with injuries, and a 31 percent drop in vehicle injuries, according to DOT. There was also good news last night from Community Board 2 in Manhattan, which in a unanimous vote became the third and final community board to ask DOT to study complete street redesigns for Fifth and Sixth Avenues. At a CB 4 committee meeting in April, DOT staff said the agency would begin looking at options in the fall. two traffic safety projects and what we hope can be brought. It is effective, I think so.